Football season is here! With all the hustle and bustle surrounding the 2018-2019 NFL season, and with the Patriots-Rams Super Bowl just around the corner, Adoptions With Love reflects on some of the many NFL athletes who have been touched by adoption. Below, you will find iconic football players who are also loving adoptive parents. You will read about NFL players who were adopted at a young age. You will also learn the stories of the players who spent many years in foster care before finding success on the football field. All of these NFL athletes, whether adoptees or parents, have inspiring adoption stories to share. 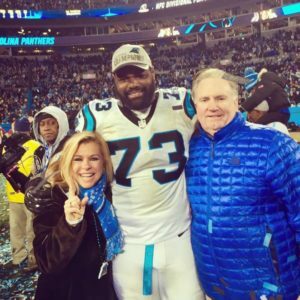 Michael Oher, a famed football star who finished his final games with the Carolina Panthers in 2016, is also one of the most well-known adoptees today. His adoption story, as well as his journey from a homeless teen to an NFL star, was the subject of the Oscar-winning film, The Blind Side. Oher’s story is a particularly moving one for those who have been touched by adoption and foster care. Growing up, Oher faced a very difficult childhood: he lived in poverty in a violent and unsafe neighborhood. He had 12 siblings and a frequently absent, drug-addicted mother. Oher entered the foster care system at age seven. By age 16, he attended 11 different schools and had a grade point average of .06. It was in that 11th school that he came to a turning point. Oher met the Tuohys, the family that would soon become his forever family, and began playing football. At 6’5” and 300lbs, he became one of the best high school football players in the country. He went on to play football at the University of Mississippi and was drafted to the Baltimore Ravens in 2009. Michael Oher shares a firsthand account of his story in his book, Beat The Odds: From Homelessness to The Blind Side and Beyond. He and his parents have also created the foundation, Making It Happen: The Tuohy Family Foundation, to support families in the adoption process. You may know Daunte Culpepper from his seven-season streak with the Minnesota Vikings, or for his time with the Miami Dolphins, Oakland Raiders, and Detroit Lions. Did you know that Culpepper is also a big advocate for adoption? This former quarterback was named a national “Angel in Adoption” in 2006 by the Congressional Coalition on Adoption Institute. He is very involved in the African American Adoption Agency (AAAA) helping foster children find permanent families, and has hosted annual golf tournaments to raise money for adoptive families. If you are from New England or just love the Patriots, you probably know of Kyle Van Noy. Traded by the Detroit Lions in October 2016, Van Noy has quickly become a very memorable linebacker on the Patriots’ roster. This football star helped the Pats get their big Super Bowl win last year, and is expected to be a driving force on their defensive lineup once again this season. Kyle Van Noy is doing big things off the field, as well. He and his wife, Marissa, started the Van Noy Valor Foundation to help adopted, foster, and disadvantaged youth in need. The foundation strives to provide opportunities for these children and to help them reach their full potential by giving them the resources needed to succeed. The couple’s inspiration for the foundation stems from their personal, intimate connection to adoption. Kyle Van Noy was adopted as a baby and Marissa’s father and brother were also adopted. Kyle explains, “We have a big heart for adoption and foster families, as well as kids who are struggling. We want to give them strength and success.” Van Noy wants children and teens in foster care to know that they too can overcome the struggles. He wants them to know that their path does not define them, and a strong future is in reach. If you are a football fan, there is no doubt you have heard the name Colin Kaepernick before. Kaepernick spent his five-year football career with the San Francisco 49ers, where he served as both a starting and backup quarterback, before becoming a free agent in 2016. Some know Kaepernick for his football stardom, while others know him for his on-field protests and off-field activism against racism. What many do not know, however, is that Kaepernick is also adopted. Colin Kaepernick was adopted as an infant after his birth mother, who was 19 at the time, decided to make an adoption plan. Kaepernick’s birth father had left during the pregnancy, and she knew she was not able to raise Colin on her own. She chose to make an adoption plan to give him the best possible life. Rick and Teresa Kaepernick adopted Colin when he was five-weeks-old, and are still in touch with his birth mother to this day. DeMarcus Ware is one of the biggest household names in the NFL game. He was the leading outside linebacker on the Dallas Cowboys for nine years straight and carried out the rest of his career on the Denver Broncos, with whom he won Super Bowl 50. He announced his retirement after the 2016 season, at age 34. Our best guess is that retirement meant spending more time with his family. 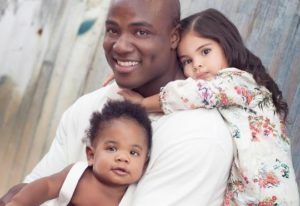 Ware has two young children – his son, DeMarcus Jr., is seven-years-old and his daughter, Marley, is nine. Ware and his wife adopted Marley after experiencing the heartbreak of miscarriage and a stillbirth. The football star has revealed that “Marley – and his struggle to become a father — changed his life, made him more responsible, fulfilled him in a way that football never had.” He is ever grateful to have been able to grow his family through adoption. Joe Berger is the starting center on the Minnesota Vikings, and also the full-time father of four children: 2 adopted and 2 biological. He and his wife, Abigail, are active supporters of adoption and adoption family causes. During Berger’s early career on the Miami Dolphins, his wife Abigail was receiving weekly fertility treatments. Their first biological son, Gavin, came after a year of trying to become pregnant, and they were told the prospect of giving birth to a second child was slim. They decided to grow their family through adoption, and adopted their son Blake later that year. They were considering a second adoption when Abigail found out she was pregnant with their daughter, Ella, a year later. They always wanted three or four children. So, when the opportunity came to adopt a fourth child, they took it. The Bergers adopted their daughter Macy in the spring of 2016. Joe Berger is not the only one on the Vikings who is also an adoptive parent. The Vikings’ General Manager, Rick Spielman and his wife have adopted their six children. Vikings’ VP Rob Brzezinski and his wife have also adopted five children. The Minnesota Vikings, as a team, were given the “Angels in Adoption” award in 2017. Do you know these football players who have been touched by adoption? Can you think of any other NFL players that are also adoptive parents or adoptees? Please share below! If you would like to learn about making an adoption plan with Adoptions With Love, please do not hesitate to contact us here. We are a non-profit adoption agency serving expectant/birth mothers throughout the United States and growing adoptive families across Massachusetts.